"Jesus loved Martha and her sister and Lazarus." Much of Jesus' 3 years of ministry was itinerant. With his disciples he walked from place to place, not always knowing where he would sleep. The hospitality of those who would open their homes to him was vital. When the people doing that were true friends then such hospitality would feel very precious. After a hard day, what better than to relax in a welcoming home in the company of the most trusted and loved friends, like Mary, Martha and Lazarus? During a visit to to the Holy Land a few years ago I noticed a plaque outside the church of St Lazarus in Bethany. It has this reflection. 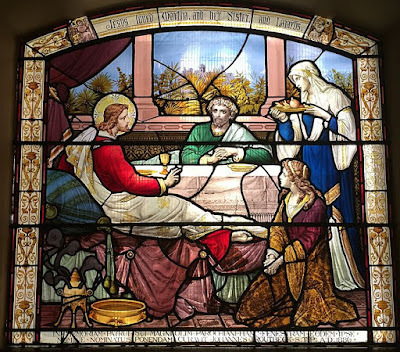 You can find a fuller and excellent post by Jem Bloomfield on today's commemoration and the people involved at 'Love in a time of argument: Mary, Martha, Lazarus and Jesus'.